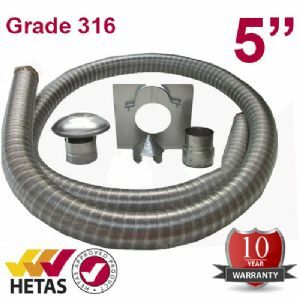 Our 5m x 5" flexible multifuel flue liner pack is Class 1 and is engineered to the highest spec using 316L Stainless Steel and has been tested to the relevant British and European standards – EN 1856 – 2 T450. Stove manufacturers recommend fitting a Mutli-fuel liner when installing a stove Our flue liner is suitable for Multi-Fuel burning (such as Coal, Peat, Dry Logs) as well as Oil and Gas. The Double Ply Liner is quick and easy to install and comes in one complete length. A flue liner will substantially decrease your chimney volume, higher temperature will be maintained in the flue – generating a better draft. Where possible flue liners should be insulated thus further increasing temperature inside the flue. A warm flue will collect less deposit, therefore cleaning will be easier and condensation should not appear in the flue.